It's time. Chorizo from Feather Brook Farms is BACK and we couldn't be more thrilled! We haven't been this excited since Guns N' Roses announced it's latest reunion tour. 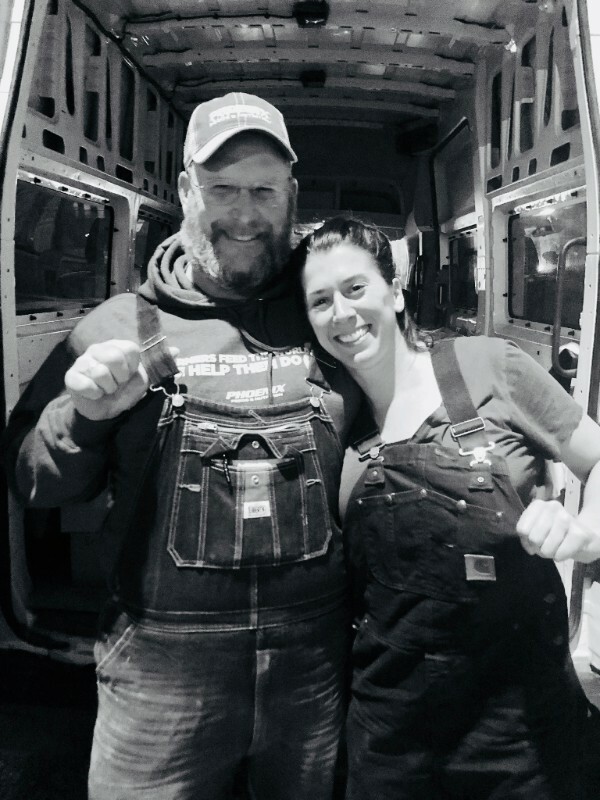 Or since Tad from Feather Brook FINALLY talked Erin into getting overalls so they could be twins. As Bon Appetit Magazine explains, Chorizo is sort of like Hot Italian Sausage in texture but its flavor is all gussied up with chilies and vinegar. The secret to Tad's Chorizo is the pigs themselves. These are Heritage Hampshire Pigs who were selected at the ideal weight for the fat and flavor ratio. In Tad's words "they were happy piggies and they are yummy." How animals are treated, what they eat, and how they are processed really matters. As Michael Pollan said "You are what you eat eats". It matters that they are fed a natural diet, have space to roam and be animals and are never, ever fed antibiotics or hormones. It means a far better life for the animals, for the Planet, and for us. In addition, as Tad says "they're yummy." Everyone wins. This week's chorizo is FRESH from the butcher. Enjoy immediately. Spicy Chorizo and Cabbage Soup: Are you looking to ward off the ubiquitous winter cold? Has your co-worker Linda been coughing over the conference sandwich tray, riling your inner germaphobe? Saveur magazine has you covered. The Napa Cabbage and spicy Chorizo combo will warm you right up and keep the sick days at bay. Chorizo White Bean Chili: If you still have some of Baer's Best Beans kicking around, give this a go. Add some of the sweet potatoes and it will feed you all week. Chorizo Scrambled Eggs: Chorizo and eggs are a beautiful match. Almost as much as Chorizo and Melted cheese dip - which everyone will love you for if you serve as an appetizer at almost any gathering. This recipe for the Scrambled Eggs calls for tortillas, but we think that thin toasted slices of the focaccia will stand in beautifully. Sweet Potato Chorizo Skins: Sure the Super Bowl is over and Tom Brady has feet for hands. But that doesn't mean that your Sundays shouldn't be full of delicious snacks meant to be enjoyed in your sweatpants. Skate Wing: Food and Wine Magazine knows that Skate Wing is a odd looking cut of fish. They also know it is wildly delicious and easy to cook. Here they give you 5 ideas but we love the simple brown butter and puree. The sweet potatoes will pair nicely here and wink at the sweetness of the fish. Salmon Belly: This is the most delectable part of the salmon, in our humble opinion. Rich in flavor and chock-a-block full of Omega-3 fatty acids, this is just a little bite of heaven plucked out of the ocean. You can go crazy adding more flavor but we like them as God intended - with a pad of butter or two in a cast iron, dusted with a bit of salt and cooked to medium rare. Serve as an appetizer with the focaccia toast, cover with greens or green shoots for a petit, elegant meal. Storing: Keep your fresh mushrooms in a paper bag or in a damp cloth bag in the refrigerator. This allows them to breathe so they stay firm longer. You don't want to store them in plastic (even though that is their packaging!) as that allows them to dehydrate more quickly. Cleaning: Do not drown your 'shrooms. You can lightly rinse of course, and clean off any debris with a wet paper towel. But soaking them too long would be a sin. Cooking: The folks at Mycoterra recommend getting the mushrooms on a gentle heat first to allow them to cook in their own juices. If you drown them in oil or butter, you will taste oil and butter. Add scant amount of those at the end of cooking once they have done their thing. Fun Fact: The Lion's Mane has long been understood to have medicinal properties. So to our lovely members who turn their nose up at mushrooms: it may be time to give them a go.